To celebrate the release of Star Wars: The Force Awakens, the Star Wars series has released Star Wars™: Commander APK 4.2.1.8486. As a part of the Star Wars series, you will find yourself in the middle of the galaxy, deciding the fate of the whole galaxy. You will choose side with either the Rebellion or the Empire. As you join the battles, you will build an army of the galaxy on your own and build the base of your own. The battles will put your defensive and offensive strategies to test, in order to determine the fate of the war around the galaxy. You will fight with or against many iconic characters from the Star Wars series, depending on the side you choose. You will find many characters like Luke Skywalker, Han Solo, Darth Vader, and the others. Gameplay will also utilize many iconic vehicles such as the Speeder Bike or AT-AT, and you will also face or fight with the iconic warriors such as the Stormtroopers and Wookie Warriors. In the galaxy, you will train and customize the legion of your army to make the best and most powerful army of the entire galaxy. Star Wars: Commander will bring you to the Story mode, where you will have to complete many missions to finish the game and master the gameplay. You can customize and level up the warriors, vehicles, and the base. As you play the game, you will wander around the worlds within the Star Wars series. You can also play the game with your friends to make the ultimate team across the galaxy. While the advertisement is rather frequent, Star Wars: Commander will ensure a smooth gameplay with wonderful experience. 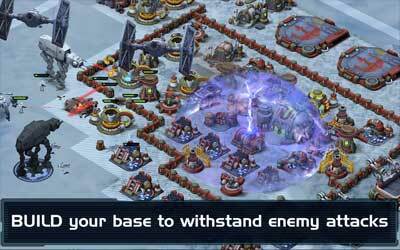 The ultimate fun of the Star Wars: Commander for Android is the full experience of getting into the epic universe of Star Wars. Squad Perks – Being part of a squad now grants access to Squad Perks, which provide temporary boosts such as faster currency production and cheaper troop training. Reputation – Win Squad Wars and donate troops to earn Reputation. Invest it to unlock and upgrade Perks for your whole squad.